Sweet pea shrubs are neat, rounded evergreens that bloom off and on all year long. They’re perfect for those spots where you get shade in the summer and full sun in winter. Sweet pea shrubs make wonderful additions to mixed perennial borders in warm climates, and they also look great in patio containers. 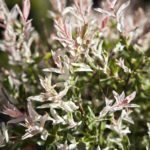 These tidy evergreen plants bloom in shades of purple or mauve with flowers that are great for bouquets and arrangements. Find out how to grow a sweet pea bush in this article. What is a Sweet Pea Bush? Unrelated to sweet pea garden flowers (Lathyrus odoratus), the sweet pea shrub (Polygalaspp.) gets its name from its similar-looking flowers. Sweet pea shrubs attract bees, butterflies and birds, making it an excellent choice for wildlife gardens. It grows 2 to 3 feet tall and thrives in sun or shade. Native to South Africa and sensitive to frost, it survives winters only in U.S. Department of Agriculture plant hardiness zones 9 and 10. The care of sweet pea bush is minimal. Sweet pea shrubs survive without a lot of supplemental irrigation, but they look best if you water them regularly. Remember that those grown in containers need water more often than those grown in the ground. Since they bloom year round, they appreciate a little general purpose fertilizer in both spring and fall. One of the things that make sweet pea bush care so easy is that it needs little or no pruning. If you need to control the size, you can give it a light trim any time of year. The stems on older shrubs may become woody. In that case, you can cut it to about 10 inches above the ground and let it regrow. Otherwise, just leave it to grow naturally. You might also want to try growing sweet pea shrubs as a small tree or standard. In that case, remove all but one stem arising from the ground and take off the side branches on the lower one-half to two-thirds of the trunk while the plant is young. You can propagate Polygala species from seeds, which fall to the ground and take root if you don’t deadhead the plants regularly. Hybrids are usually sterile. Propagate them from softwood cuttings taken in spring or fall. Read more articles about Sweet Pea Bush.